﻿ Using Stones for Personal Growth. Moss Agate: Patience. Moss Agate is a colorless, translucent chalcedony (micro-crystalline quartz agate) that contains moss-like green inclusions of hornblende, usually in the shape of small clumps of moss or narrow branches of foliage. In addition to the moss-green color, it can also contain patches of red, lighter green, yellow, and brown-black. The best qualities of moss agate come from India, while other deposits exist in China and USA. 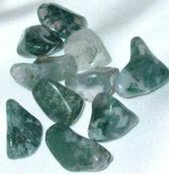 In early times moss agate was used by Native Americans as a power stone. Moss Agate acts on the Inner Being to strengthen Patience. Patience is the ability to allow things to move at their own pace, even though your pace may be different. It is the ability to let things happen in their own time, rather than trying to push them to happen faster. If you are a patient person, you give things time to happen. You realize that other people, as well as the universe in general, move at their own pace despite what your personal agenda may be, and you don't push your will against this pace to try to change it. The minute you become impatient for something to happen, you put your energy in opposition to the natural flow, and this creates a conflict that you may not be able to win. When you become impatient, you want things to happen faster than this natural flow allows, and you push against the flow to try to force things to go faster. But you are just wasting your energy by being impatient for something to happen if it is not yet time for it to happen. If you work against the natural flow in this way, it stubbornly digs its heels in and refuses to budge. However, if you contribute to the flow by working with it in a positive way, you can often make things happen faster. The difference lies in whether you are helping or hindering the natural progression of events. For example, when your friend tells you she is going to be late for your meeting because she has errands to run first, instead of hindering the flow by becoming impatient and upset with her, you could help the natural flow of events by offering to help with the errands. Patience consists of two parts: The first part is the ability to be patient with yourself or others. The second part is the ability to recognize the natural rate of progression of events, the rate at which a particular thing wants to happen, so you can work with this flow and contribute to it instead of working against it. These two things go hand in hand. If you are good at seeing how fast something wants to happen, you also find it easy to be patient. If you have difficulty with patience, you tend to be restless and become easily exasperated when you have to wait for things to happen. You often become tense and impatient with how long things take, and you push to make them happen faster. As a result you sometimes have to go back later and redo something that wasn't done right the first time. In addition, you tend to become impatient in traffic because you are often in a hurry. In your own learning and growth, you can become impatient in wanting to have it all immediately. You can even become impatient when you see unfairness in the world around you, and you can't wait for things to change and make a better world. To practice patience, learn to cooperate with someone by combining your efforts in order to achieve a common goal. By working together to make things flow as smoothly as possible, you learn to not insist on always having things your way, and you practice your ability to find a pace that you both can work at. In working together, you will likely need to make some compromises, and this also helps you become more patient. Cooperating with people helps develop patience because it requires a willingness to compromise and let things progress at a pace that is suitable for everyone. Another way to develop patience comes from realizing that, whenever you are working toward something, you are creating value at a rate that is linked to your pace of working. This pace is the natural flow. If you can learn to help this flow rather than hinder it or fight against it, you are well on the way to becoming a more patient person. You can work with this flow in a positive way, for example, by working harder or more efficiently. By helping the natural flow in this way, you can often make things happen faster. You can also hinder the flow by fighting it, for example, by wanting instant gratification and not being willing to put energy into something before reaping the rewards of having it. If you can truly see that your energy input is creating value all along the way, you will happily work toward your goal while you wait patiently for the results. Three keys that open the door to enlightenment are practice, perseverance and patience. Practice is the easiest. Perseverance is the most demanding. Patience is the most difficult.